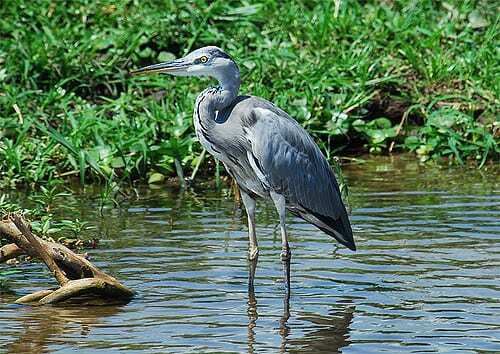 The 14 days bird watching tour Uganda, takes you to the prime bird watching spots in Uganda. Whilst on this 14 days birdwatching safari in Uganda you will get to visit parks like Bwindi, Queen Elizabeth, Murchison Falls and Lake Mburo. Watch out for birds like the most sought after shoebill stork, pelicans, sunbirds, cuckoos, and so much more. Arrive at the airport to meet the company representatives who will transfer you to your hotel Overnight at Central Inn hotel. Day 2: Drive to Transfer to Lake Mburo National park. Day 3: Nature walk Bird watching. Spend the whole day searching for birds and you should watch out for the the Red-faced Barbet, that can only be spotted in Lake Mburo. Watch out for the Papyrus Yellow Warbler , Brown-chested Lapwing, Abyssinian Ground Hornbill , Carruther’s Cisticola, African-wattled Lapwing, Saddle-billed Stork, Tabora (Long-tailed) Cisticola and the rare shoe bill stork plus the endemic African Finfoot and so much more. Lake Mburo national aprk has over 350 different species of birds. Overnight at previous lodge. Day 4: Transfer to Bwindi. In the morning right after breakfast, you will drive to transfer to Bwindi. The drive will take you 6 hours arriving in the afternoon. Go for a nature walk in the community. Watch out for some resident birds of the area. Overnight at Buhoma community Bandas. In the morning after breakfast, transfer to the park headquarter for briefing about gorilla trekking. Read about the gorilla trekking rules and guidelines. During the briefing, you will be allocated a gorilla tracking family and through the forest start the search for the gorillas. As you search for gorillas, watch out for plenty of birds and the park ranger will be aware and informative of the different bird species that you come along during the trek. On meeting the gorillas you will be allowed to spend 1 hour fooling them and then later return to the starting point. Day 6: Full day bird Watching in Bwindi. Spend the whole day searching for birds in Bwindi national park. Consider walking along the Mubwindi Swamp Trail. Wath out for the Albertine rift endemics, which are 23 in number. Other species to watch out for are African Blue and White-tailed Blue Flycatchers, African Emerald Cuckoo,Short-tailed Warbler , Blue-headed Sunbird, Common Bulbul, and Red-headed Bluebill. The park is home also home to 7 IUCN red data listed species. Overnight at your previous lodge. Day 7: Transfer to Queen Elizabeth Ishasha sector. In the morning right after breakfast you will drive to transfer to Queen Elizabeth national park to go bird watching. Arrive in 4 hours – time and then later in the afternoon go for a game drive and also bird watching near the Ishasha river. Watch out for tree climbing lions and other wildlife too. Overnight at the Ishasha river camp. Day 8: Bird watching/ Boat cruise. Early in the morning before sunrise on this 14 days birdwatching tour Uganda, you will go for a game drive in the park. Watch out for the carnivores like lions, hyenas and so much more. And also plenty of birds in the Kasenyi area of Queen Elizabeth national park. Later in the afternoon, you will go for a boat cruise along the Kazinga channel, an area known to have the largest concentration of birds. Bird watching in Queen Elizabeth park will reward you with birds like the Pelicans, African White-backed Vulture, Pied Kingfisher, Zitting Cisticola, Yellow-throated Longclaw, Widowbirds, Bishops, Grassland Pipit, Senegal Lapwing, Spur-winged Lapwing, Scarlet-chested Sunbird, Kittlitz’s Plover, Croacking Cisticola, Water Thick-knee, Sooty Chat, African Spoonbill, Grey-headed Kingfisher, Black-bellied Bustard, Red-chested Sunbird, Black-headed Gonolek, and so much more. Overnight at Bush lodge. In the morning right after breakfast, you will drive to transfer to Kibale National park. Go for a nature walk in Bigodi wetland and watch out for birds like the Shoe bill stork,Dusky crimson wing,Papyrus Gonoleks, Yellow rumpled tinker bird, Flycatchers, Western nictor, Black bee eater, Little greenbul, Brown throated wattle eye, Blue breasted kingfisher, , Black bishop, Spotted bardet, Brown chested alethe, white-spotted fluff tail and so much more. Overnight at Kibale forest camp. In the morning right after breakfast, you will drive to transfer to Kanyanchuarea to go searching for birds. 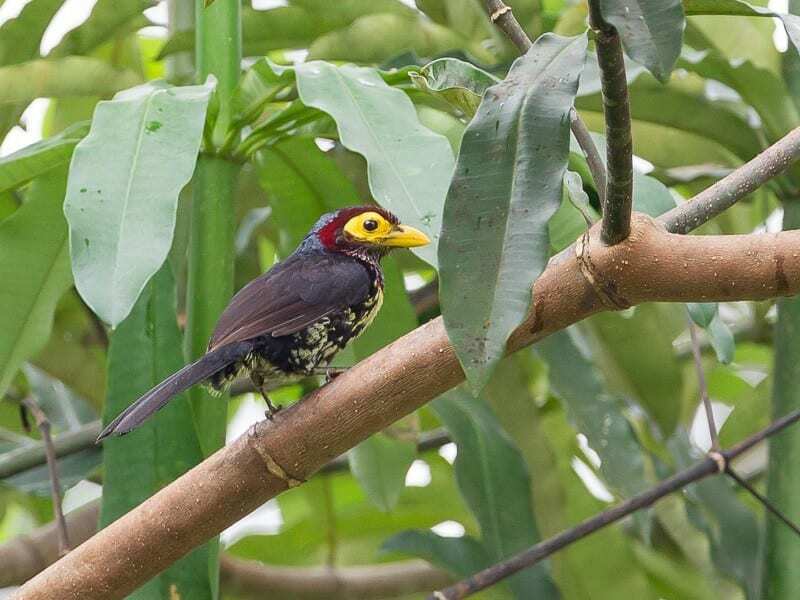 Watch out for birds like the Narina Trogon, Narrow-tailed Starling, Black-billed Turaco, Yellow-billed Barbet, the Green-breasted Pitta, Chestnut Wattle eye, Sabine’s Spinetail, African Emerald Cuckoo, and Blue-shouldered Robin-chat, among others. Apart from birds you can also watch out for primates like baboons, monkeys, red colobus, black and white colobus and also the grey cheeked Mangabeys’. Kibale national park is home to 13 different species of primates making the largest number in one place on the African continent. In the Afternoon, you can go trek chimpanzees. Day 11: Drive to Murchison falls. Depart the hotel at 6am to drive and transfer to Murchison falls national Park. The drive will take you the entire day. This is a long drive and therefore packed lunch will be provided. Overnight at Red chilli Bandas. In the morning before sunrise, you will go for a game drive on the northern bank of the river Nile. Watch out for wildlife, including lions elephants and so much more and then also do not miss out of the birds in the area. Later in the afternoon you will go for a boat cruise along the Victoria Nile to the bottom of the falls. The shores of the river are filled with wildlife and also plenty of birds. Watch out for birds like the woodpeckers, Crombecs and warblers, hamerkop, Grey Heron, Flycatchers, Cuckoos, Giant and malachite kingfishers, Francoline and so much more. 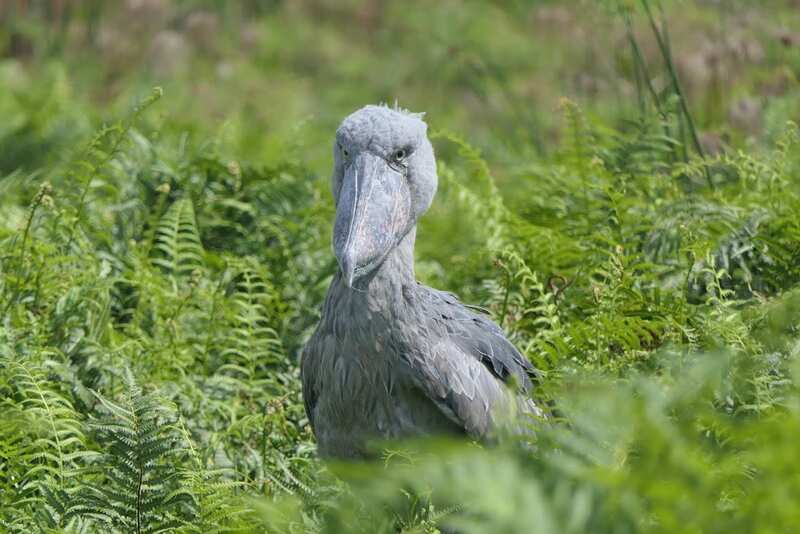 The Shoebill stork has also been spotted in Murchison Falls however its commonly seen between January and March. Day 13: Transfer to Kampala. Stop and Rhino sanctuary. In the morning right after breakfast, you will drive to transfer back to Kampala. On the way you will visit the rhino sanctuary and then later head to Kampala. Proceed to arrive Entebbe in the late afternoon hours. Overnight at Central inn Hotel. Day 14: Mabamba wetland Bird Watching / Departure.